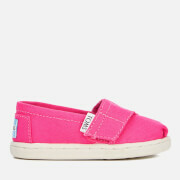 Toddlers’ ‘Biminis’ slip-on pumps from L.A. footwear label, TOMS. A member of the One for One® family, TOMS match every pair purchased with a pair of shoes for disadvantaged children. 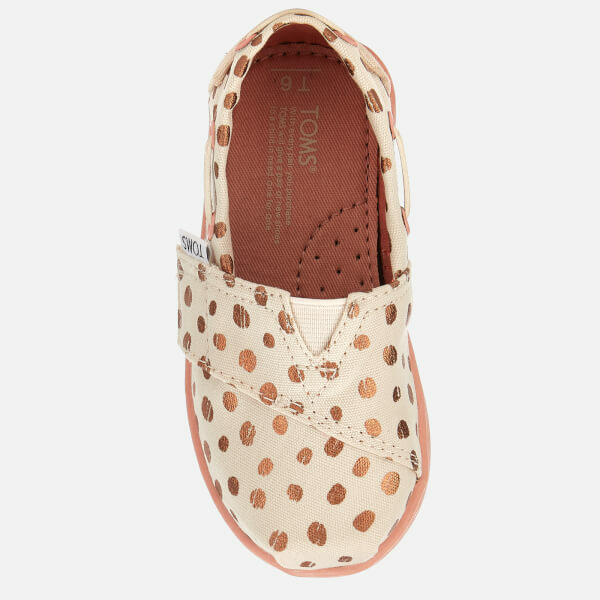 Crafted with white patterned canvas uppers, the pumps are designed with an all over, rose gold-tone polka dot pattern, side lace detail and an adjustable hook and loop strap for a secure fit. 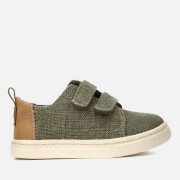 The slip-on shoes comprise a rounded toe with TOMS signature toe-stitch and an elasticated ‘V’ panel to easily get them on and off. The vegan pumps sit on a pink rubber outsole for durability and traction. 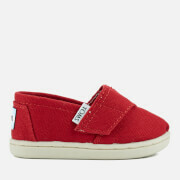 Complete with a woven TOMS label stitched to the vamp and signature branding on the heel.